If you have made the decision to feed your dog a raw diet, you have likely come across the question of what you should use for training treats. Many trainers suggest using bits of the dog’s kibble, while others use processed treats, cheese, or even hot dogs. These are not great options for pet owners who have made the choice to feed their dog a balanced diet. However, there are a number of options available and you can even use treats to add variety into the diet. First, I’ll discuss why some of the more commonly used treats are not good for your dog. Items like hotdogs or other deli meats are processed and contain ingredients that could be detrimental to your dog. A quick search for hotdogs will find ingredients like corn syrup, spices, cane sugar, and sea salt. While some of these ingredients are derived from natural sources, they are still not species appropriate for our Domestic Carnivores. For example, the amount of salt in processed meat will cause a dog to retain fluid and can lead to cardiovascular issues over time. Giving these items to your dog is not good for your dog’s overall health and well being. There is good news though. We are fortunate to have many pet loving companies and we offer a large selection of dehydrated, freeze-dried, and air-dried treats that are perfect for the occasional snack or as a training treat. Most of our products are sourced and made in Ontario so you know you are giving your dog the best quality treats. 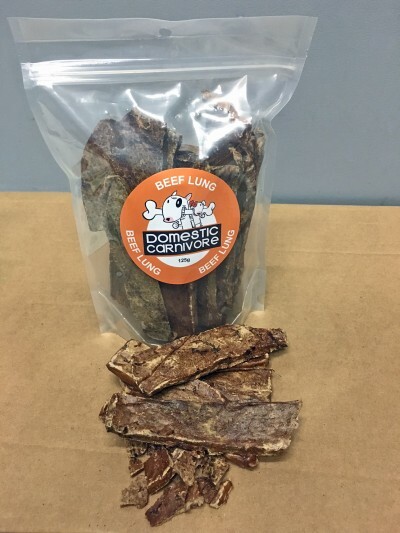 Dehydrated Beef Lung : An easy to break treat suitable for dogs of all sizes. Cats love them too. One of our most popular training treats is dehydrated beef lung. 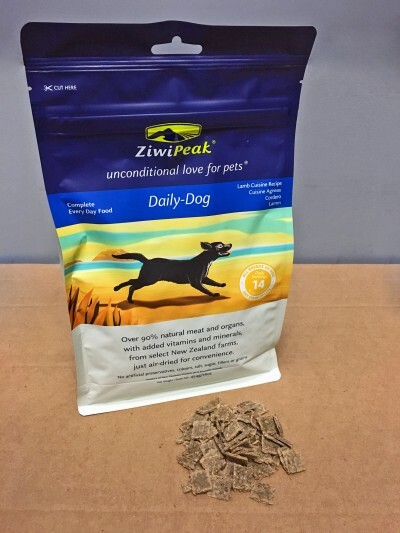 Beef lung is easy to break up, easy to digest, and the dogs love it so much that we call it “dog crack.” Another popular training treat is ZiwiPeak air-dried dog food or K9 Natural freeze-dried dog food. Both of these options offer a softer treat, which is great for puppies and dogs of all sizes. Ziwipeak: An affordable treat that is already broken up in bite sized pieces. If your dog is on a restricted diet due to allergies we can find a great treat for them that will match up with their requirements. 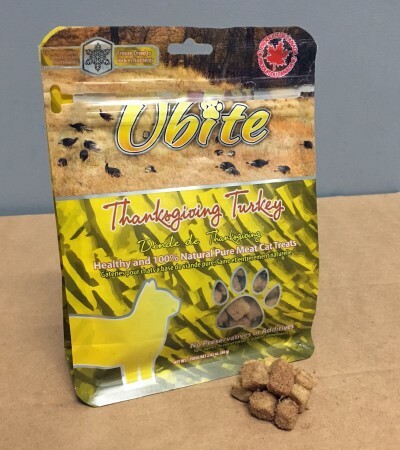 We are happy to offer treats in a huge variety of protein sources including kangaroo, rabbit, turkey, pork, beef, lamb, chicken, duck, smelts, and many more. Ubites: Single ingredient treats available in bite sized pieces. No matter what you are looking for in a training treat, Domestic Carnivore can help you find something that your dog will work hard for.